Officially I’ve never read Chloe Neill before, I’ve had Some Girls Bite sitting on my Goodreads wishlist for a while and I just never got round to getting it. Since being offered a copy of The Veil and The Sight I’ll be getting SGB quick time. 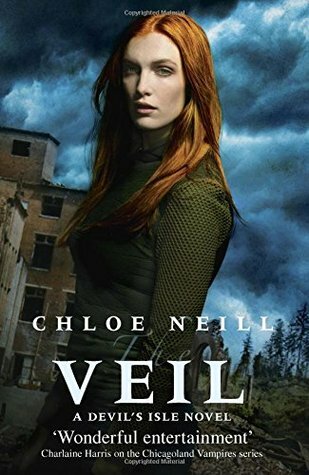 The Veil follows Claire Connolly- a twenty-something, red-headed shop owner and secret sensitive – as she struggles to hide her secret powers from Containment seven years after the Veil split the sky and Paranormals or Paras pored out in droves and started a war. The aftermath of the split ended up with Paras being placed in the aptly named Devil’s Isle where they live like prisoners. Sensitives – like Claire – have various different powers (Claire’s is telekinesis) but if they don’t ground themselves and release the magic that lives within them it consumes them and they become wraiths– a being that hunts for other magic users for their magic. This book follows the story of Claire and her friends who are each unique in their own way and her meeting with Liam Quinn the bounty hunter. Oddly enough with Liam although his name certainly sounds Irish he’s actually Cajun and he lives in Devil’s Isle with the Paras though he’s totally human. Liam’s main job in life is to find wraiths and get them help in Devil’s Isle- due to an unfortunate incident with his sister. When he meets Claire he is understandably rather off put by her being a Sensitive because of the possibility of her turning wraith. Their paths cross after Claire interrupts a wraith attack and their relationship builds from there. I liked how they were originally opposites and you know how they say opposites attract? Yeah I can feel the tension and see their relationship getting more and more heated. The writing style to this book was a little different to what I’m used to- I find myself edging towards third person point of view for hardiness- the first person point of view was written well and there was a nice balance between drama and humour. The character dynamics were incredibly good and the only thing that really put me off was the token gay best friend – I’m not really a fan of that – but it was still good. I really enjoyed the pacing to this book – not too fast but not too slow – and the story developed at a good pace for me. My favourite part has got to be when Liam and Claire almost kissed. That’s it. There is no massively romantic scenes in this book which was great! I can’t wait to see where the next book The Sight takes the story.